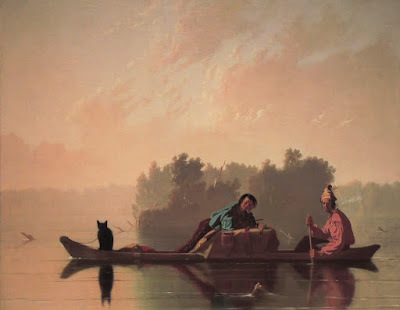 Fur Traders Descending the Missouri, 1845; oil on canvas, 29 x 36 1/2 in. .....the water is glass-smooth...there is not the faintest breath of wind, nor stir of leaf; the tranquillity is profound and infinitely satisfying.....You have the intense green of the massed and crowded foliage near by; you see it paling shade by shade in front of you; upon the next projecting cape, a mile off or more, the tint has lightened to the tender young green of spring; the cape beyond that one has almost lost color, and the furthest one, miles away under the horizon, sleeps upon the water a mere dim vapor, and hardly separable from the sky above it and about it. And all this stretch of river is a mirror, and you have the shadowy reflections of the leafage and the curving shores and the receding capes pictured in it. 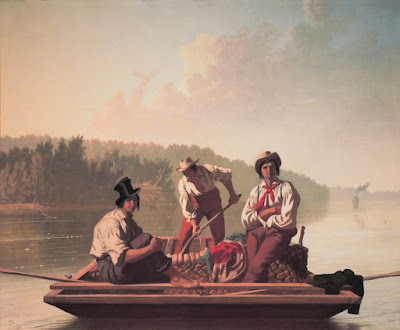 "....the tranquillity is profound and deeply satisfying...": this is a quality in these river paintings by Bingham, even those with active motion in them, such as The Jolly Flatboatmen below. It comes from the extreme clarity of form, with outlines that are sharp and well defined, and with planes that recede––foreground, middle ground, background–––in an orderly progression. These are traits of classicism in painting, along with the triangular compositions of most of these paintings; according to the Encyclopedia Britannica classicism consists of "harmony, clarity, restraint, universality, and idealism". Self-Portrait, 1834-35; oil on canvas, 28 3/8 x 26 11/16 in. Bingham brings an American form of classicism, mixed with a careful attention to actuality, but seen through a primitive eye. 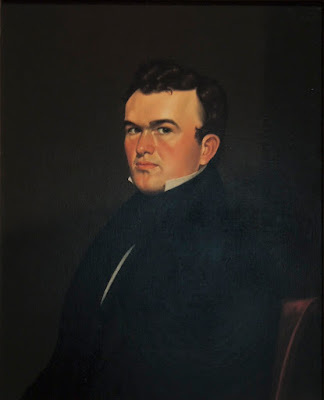 He began as a portrait painter, and you can see in this early self portrait a combination of flatness and crisp precision that is akin to that of early itinerant portrait painters. 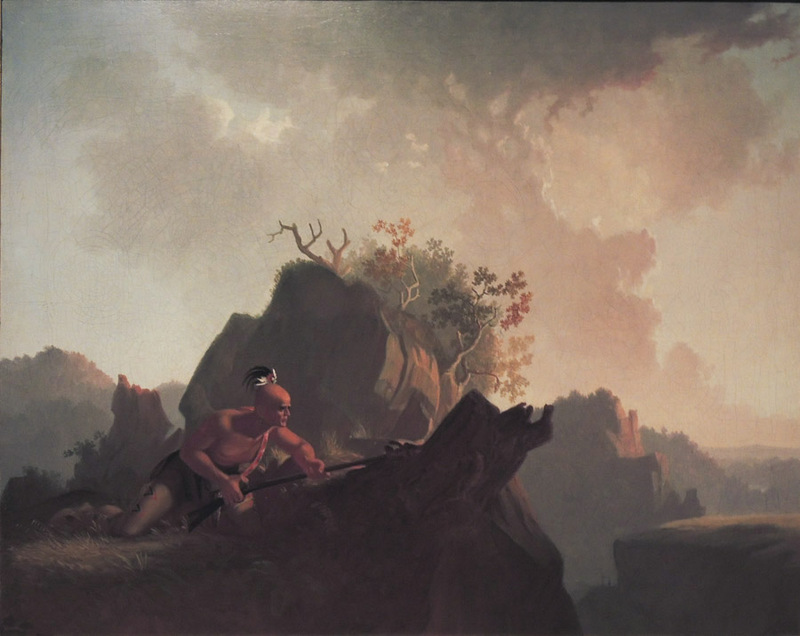 The Concealed Enemy, 1845; oil on canvas, 29 1/4 x 36 1/2 in. Although mainly self taught in the Missouri of his childhood, Bingham traveled to Philadelphia in 1838, when he was 27 years old, and spent three months there, where he must have seen many contemporary American works, and also European paintings, drawings, and prints; he may have also traveled to New York to see the National Academy annual. 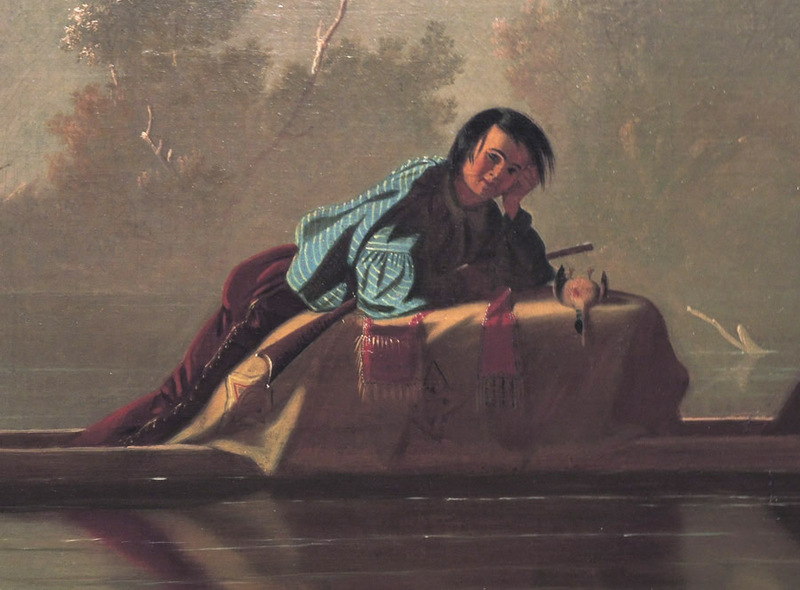 It wasn't until 1845, though, with The Concealed Enemy and Fur Traders, that his mature style emerged. 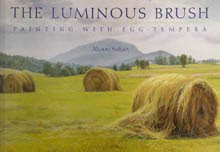 I go into all this because it is remarkable that Bingham worked in such a sophisticated manner, close to the style called Luminist, while being far from the centers of art activity. Novak and others speculate that he may have worked from instruction books. A friend of a friend said that he was very influenced by Poussin; he saw prints after Poussin in Philadelphia. 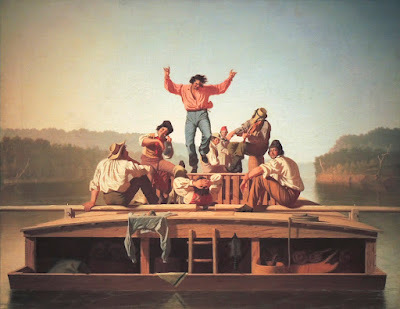 He did participate in the New York art world of the time, sending The Concealed Enemy and Fur Traders Descending the Mississippi to the American Art-Union. Boatmen on the Missouri, 1846; oil on canvas, 25 x 30 in. Two men on a boat are seriously regarding us, while a third bends at his task. The precision of the light on the figures and the brightness of their three white shirts pops them forward spacially, as the landscape recedes in a dreamy haze. I love looking at the elements in the painting and seeing how carefully they are considered: the lines of oars, the diagonal of shovel handle being repeated in the movement of hat to hat to hat, and in the diagonal of clouds; the circling curves of arms; the mass of trees at left balanced by the river steamer in the far distance at the right. All of Bingham's paintings have this attention to detail. The men and boys in the paintings are specific characters, worked up from portrait drawings (see below). They are real people, painted in a way that transcends specificity. The Jolly Flatboatmen, 1846; oil on canvas, 38 1/8 x 48 1/2 in. This is a painting that has quiet within its motion: the triangular composition fixes the men in their positions; it is an ordered levity. At the lower part of the painting is a strong horizontal, then a broad curve, surmounted by the triangle of human activity. 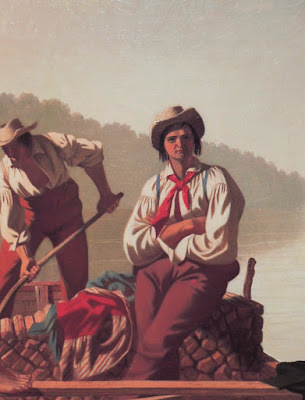 One thing I love in the paintings was the addition of humble details of working life, or of objects seen on the river. 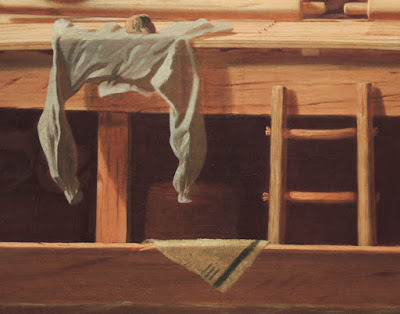 A shirt, dangling its arms and held down by a stone––it was probably drying after being washed–––is above a triangle of cloth draped over the edge of the boat, its shape emphasized by a dark line. It looks to me like the shirt was a later addition, because it is now quite transparent on the right. The Wood-Boat, 1850; oil on canvas, 25 1/8 x 30 in. 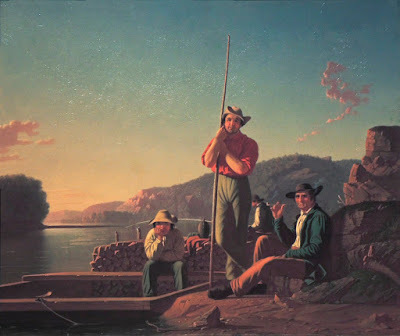 Sometimes the light in the paintings was of evening, with the sky darkening and the sun casting a reddish light. Here a tall vertical pole emphasizes the peak of the triangle in the composition. The two men and a boy look at us with unconcern, with friendliness, with wariness. 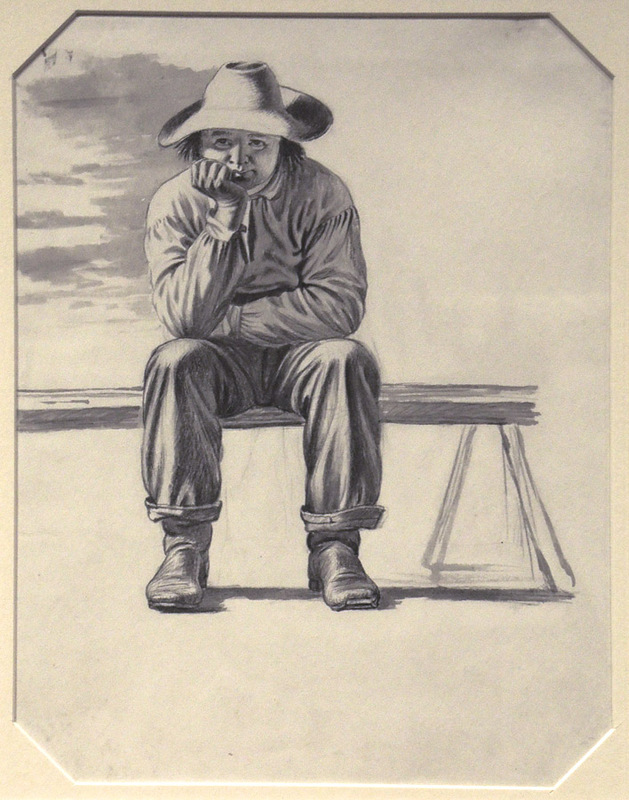 Young Wood-boatman, for "The Wood-Boat", 1850; brush, black ink, and wash over pencil on off-white wove paper; 11 3/4 x 8 7/8 in. Here is one of the studies for the painting above. Bingham's drawings are very lively, full of presence, and very personal. 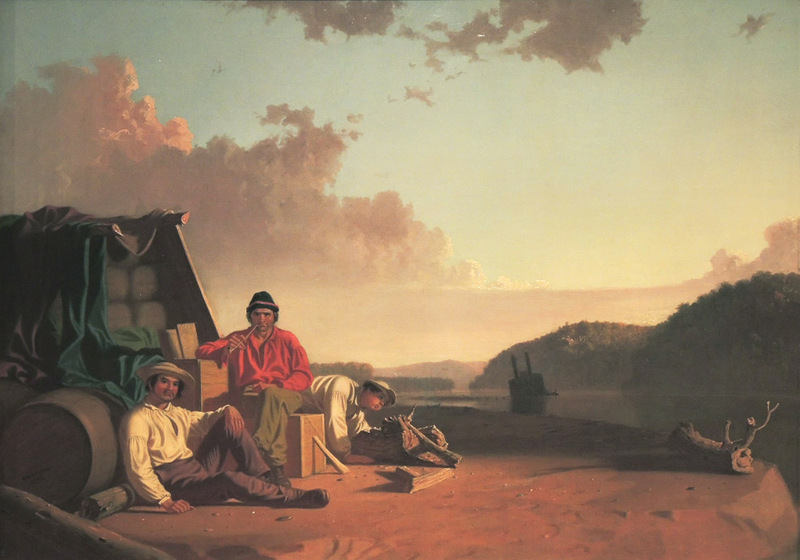 Watching the Cargo, 1849; oil on canvas, 26 x 36 in. Watching the Cargo is another painting with beautiful evening light, a red glow suffusing everything. The two men sit calmly regarding us while a young man is busily blowing on a fire to get it started. The clouds piled up behind the mass of cargo emphasize the diagonal of tented cargo to man in red shirt, to fire-maker, while the distant hills create an opposing movement. 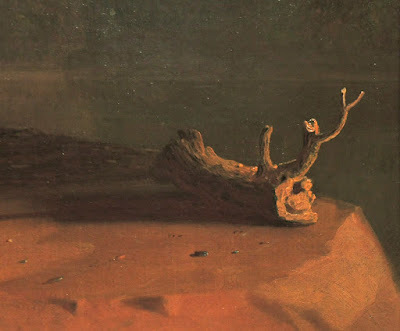 On the far right is a piece of tree trunk, possibly washed up by the river, or brought there by the men to use as firewood. It has a personality all its own, and it has the important function of carrying our eye to the right hand side of the painting. Watching the Cargo by Night, 1854; oil on canvas, 24 x 29 in. Finally, one of Bingham's night paintings (sorry about the poor photo; it was hard to photograph). 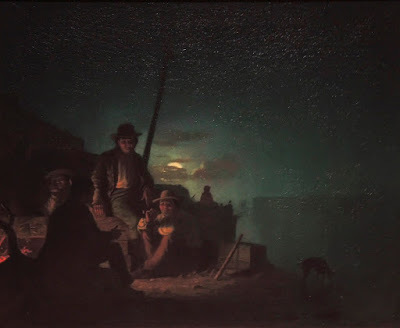 The light is beautifully mysterious, with both firelight and the light of the rising moon. 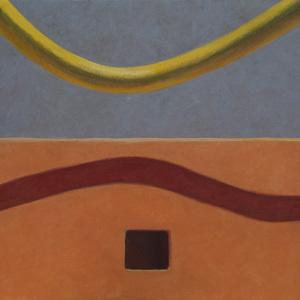 The painting is divided nearly in half, with a triangle of land and figures and the sky and river behind it; the diagonal of a pole balances the opposite dark diagonal of land. It was such a rich and satisfying experience to spend time with these marvelously made paintings, and to enter their world of men working on the river, ordinary lives elevated to the timeless and essential. Thank you, Altoon, for your thoughtful response. I enjoyed this exhibition when it was in Fort Worth & just now I enjoyed it again! I'm pleased you liked the post, Leslie. would hunters have a cat leashed to their boat? For reasons not completely disconnected to those for their wearing clown-hats. They may be hunters from Brasil, where the maxim is "who don't have dog hunt with cat." Could it be a fishcat? NO, JBS, it's a bear cub. Enough! The enlarged detail at the Met-site reveals the bear-cub nose. I can't help smiling as I remember the mama great horned-owl sitting on her nest about 70 feet up, sticking out above the treetops, and looking for all the world like a cat up there. I'm not patient; I was about to strangle you!